As I said before, IBPS is not equal to bank exam. People who think like that should check the online application for NIMHANS recruitment, here. Looks familiar right? Only the logo and the pages of the registration pages change for IBPS recruitments. Third-party firms have agreements with IBPS for their hiring process. The former will decide the eligibility requirements and syllabus for their recruitments. IBPS’s duty is to collect application forms, generate call letter, allot centers and conduct the online exam. IBPS then handover the results to partner, who conduct the later part of selection process. However, the IBPS website www.ibps.in is dedicated only for Bank exams. IBPS Exams that comes in IBPS.IN are PO, Clerk, Specialist (SO), and the RRB recruitment. They are also responsible for interviews when it comes to banking. The first step for IBPS exam is online application. In my case, the NIMHANS registration was on the above link. The date for online registration is there on the IBPS form for each recruitment. Now if you’re applying for IBPS exam, you have constantly check the official portal or third-party websites on bank exam. IBPS publishes the approximate dates of PO, Clerk, SO exams and RRB recruitment in the beginning of every year. 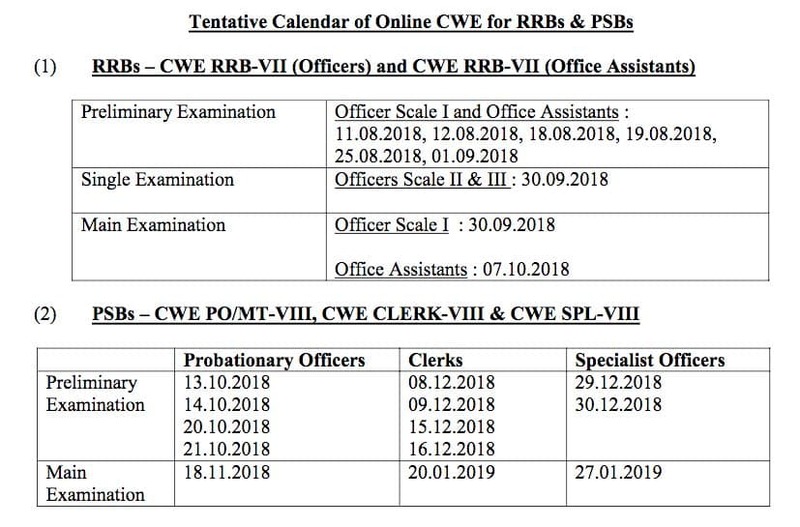 The latest IBPS exam dates in 2018 is what you see above. Download the official PDF notification from www.ibps.in. You have to carefully read the recruitment notification, especially the eligibility criteria, before you apply online. If you’re eligible you may click on the application link to submit your form. There is a fee for IBPS exams under all categories. It was 1000 INR for NIMHANS recruitment. IBPS will confirm your registration upon payment of the fee through an SMS and email. After this you have wait for IBPS to release the admit card. The caller letter includes the date and venue of your online exam. A few days before the exam IBPS will send you a mock-test URL to practice the online platform. The procedure and experience at IBPS online exam center are the same whether you take bank exam or NIMHANS exam. All you need to bring to the IBPS EXAM center is your admit card and a photo ID proof. You have to enter at the IBPS center at least 3 hours before exam schedule. The online exam starts only a few hours after the time that you see on the admit card. My examination was at Rajagiri, and I saw a long queue when I reached the college campus. You have to stand in this queue until the verification process completes. IBPS executives will verify your documents before they send you to the computer lab. The invigilator at computer lab will allot you a PC for you which have the IBPS software installed. I got some time to read all the instructions before the exam. The interface options in the IBPS web application for the online exam is just the same as I experience in the mock-test. Hence, the answering procedure was effortless. You can’t submit the form even you complete the examination before the allotted time. You have to wait until the last second to do so. For NIMHANS exam it was possible to view the total score immediately after submitting the answers. From what I learned it is not possible with IBPS bank exams. Government organizations using www.ibps.in for online exams and recruitments. As I said before, IBPS’s use in hiring is not limited to Banks in the IBPS PO, Clerk, Specialist Officer (SO), and RRB recruitment. Following are major government organizations using IBPS for online exams in 2018. State Bank of India (SBI): For Assistant, PO and Specialist Officer Exams. Life Insurance Corporation of India (LIC): For Assistant, AAO and ADO exams. Reserve Bank of India (RBI): For Assistant and Grade-B Officer recruitment. Government Insurance companies like UIIC, NIC. Private banks like Federal Bank, South Indian Bank. Hospitals like NIMHANS for Staff Nurse selection. This is not the end, we are currently preparing the full-list of companies using www.ibps.in for there hiring actives. Disadvantage of IBPS Common Recruitment Process (CRP) in 2018. Gone are the days when candidates had to write multiple offline exams for bank recruitment. The main advantage of IBPS exam is the transparency in recruitment. As everything is digital and the participating companies get the results of the online exam in no time. However, there are many areas IBPS need to improve, especially the website www.ibps.in. IBPS site is not mobile responsive. Hence, it is not possible for the candidates to apply IBPS EXAM through a mobile phone. Moreover, it is not possible to login IBPS site, and download admit card from a mobile device. My suggestion for improvement would a setup similar to that of Kerala PSC have. KPSC has an application system at thulasi.psc.kerala.gov.in, which let you create a profile after a on-time registration. Although the web application is not responsive, you get the details of all your exams and their results when you login to KPSC Thulasi. It is high time IBPS allow candidates to create an account on their website to mange and track all their applications online.